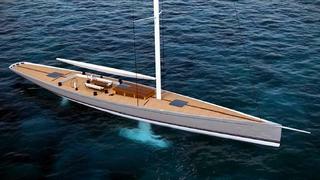 Reichel Pugh Yacht Design is developing a new 34.95m classic racing sailing yacht design. Well known for their modern designs, they were keen to design a yacht that recreated the classical elegance of a bygone era and combine it with a modern underwater shape and appendages. Developed in the spirit of tradition with high performance, this modern classic can be built of alloy or composite to suit the owner, with an option for a fixed or lifting keel. The teak covered deck is simply laid out for ease of sail handling; all the winches are push button, hydraulically powered. The rig is specified as carbon with swept back spreaders and non-overlapping jibs for ease of handling. The principal design parameters were a graceful aesthetic and stunning performance. Elegant teak decks with a low bulwark complement the classic lines of the deck geometry while maintaining functionality for racing. Below deck the yacht is modern and comfortable with a main saloon that features extensive seating areas on port and starboard, enclosed head and separate shower forward, a twin navigation station on the port side aft of the main saloon and a galley on the starboard side aft. Reichel Pugh Yacht Design is developing the structural design in-house and builds upon the success and experience of the design office’s engineering team in providing complete composite/metal structural design analysis and solutions. Construction scantlings will meet the latest ISAF Offshore Special Regulation Category “1” requirements.